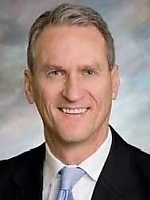 Info Dennis Daugaard was elected South Dakota's 32nd Governor on November 2, 2010. Dennis grew up on his family's dairy farm between Garretson and Dell Rapids. Dennis' grandparents had come from Denmark and purchased the farm in 1911. Both of Dennis' parents were born deaf, making sign language the principle means of communication for his family. Dennis has been certified as an interpreter for the deaf in American Sign Language. Dennis attended a one-room country school near his home until the seventh grade, when the school was consolidated into the Dell Rapids School District. Following graduation from Dell Rapids High School in 1971, Dennis attended the University of South Dakota. He worked his way through school with jobs of washing dishes, waiting tables, welding on the Load King assembly line, and sandblasting and painting water towers for Maguire Iron. Dennis graduated from USD in 1975 with a B.S. in Government and minors in mathematics and psychology. Following graduation, Dennis attended law school at Northwestern University in Chicago, Illinois. During law school, he held jobs as a bus driver, law clerk and security guard. After earning his law degree in 1978, Dennis passed the Illinois bar exam and worked in the Chicago area for three years. Dennis moved back to South Dakota in 1981 to marry his high school girlfriend, Linda Schmidt. Two years later, Dennis and Linda purchased the Daugaard family farmsite where, over the next year, they built their own home. Their children Laura, Sara and Chris are the fourth generation of Daugaards to live on the family farm. From 1981 to 1990, Dennis worked for what is now US Bank in Sioux Falls. Dennis was ultimately promoted to Vice President, and was responsible for trust administration and new business development in eastern South Dakota. In 1990, Dennis left the bank to become the Development Director of the Children's Home Foundation, the fundraising arm of Children's Home Society of South Dakota. Dennis worked for 12 years in that position. In 2002, he became Executive Director of Children's Home Society of South Dakota. Dennis left Children's Home Society on October 31, 2009 to focus full-time on his campaign for governor. Dennis became involved in politics in 1996 when he was elected to the state Legislature. He was re-elected by wide margins in 1998 and 2000. His legislative record was particularly focused on protecting children, helping the disabled, and getting tough on crime. In June 2002, Mike Rounds selected Dennis to be his running mate as the Republican nominee for lieutenant governor. The Rounds/Daugaard team was elected in 2002 and reelected in 2006. As lieutenant governor, Dennis served as President of the Senate, directing the debate when the Senate convenes each day during the legislative session. Dennis also assists the Governor in pursuing his legislative agenda, and assumes other duties as he may direct. Dennis chaired the Worker's Compensation Advisory Board and the Zaniya Health Care task force, and also served on the Constitutional Revision Commission. He was instrumental in the creation of the SD Ellsworth Development Authority, and has been a leader of the SD Honor Flight program. Dennis successfully sought the Republican nomination for governor in June 2010, winning 50 percent in a five-person field. He and his running mate, former house speaker Matt Michels of Yankton, were elected in November 2010 with 62 percent of the vote. He was sworn in as Governor on January 8, 2011.